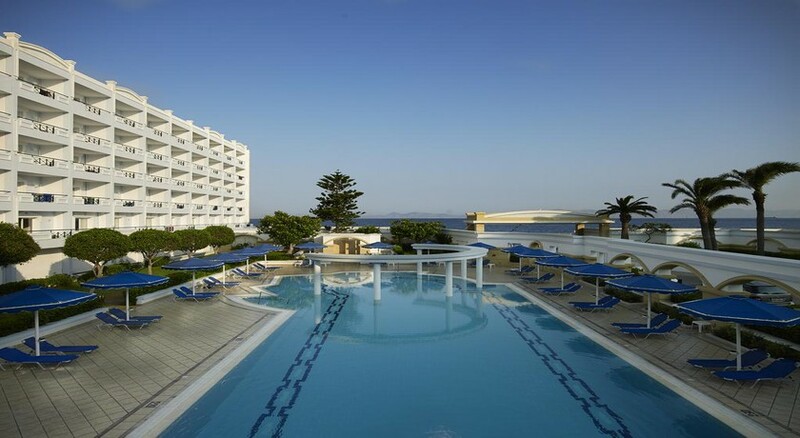 If you're looking for the perfect mix of relaxation and adventure then the Mitsis Grand Hotel, Rhodes is a great choice for sun-seekers. A popular Greek island choice for couples – or fun seekers - this all-inclusive luxury hotel offers excellent facilities and a high standard of service. With five stars to its name, it's close to a gorgeous sandy beach yet within easy reach of the town's hotspots. Food lovers will enjoy the dining options here with an array of mouthwatering cuisines at its many restaurants. Mitsis Grand offers an unforgettable holiday experience to guests. With a range of exhilarating watersports on offer at the nearby sand and pebble beach and proximity to excellent shops, cafes and bars, this hotel is a great place to stay for a premier sun-soaked beach break. 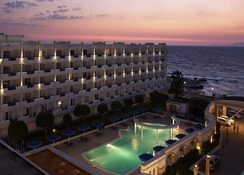 Mitsis Grand Hotel is located on the tip of Rhodes Island very close to the harbour. Located within a short walking distance of restaurants, shops, cafes and bars it is just 600m from a bus stop. It is a short drive away from fabulous beaches and the resorts of Falkiraki (17 km), Pastida (12 km), Afantou (22 Km). Rhodes International Airport is 14 km away. 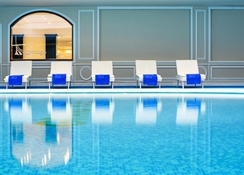 Mitsis Grand Hotel has 405 luxurious rooms categorised as rooms or suites. Contemporary in styling, these rooms have en-suite bathrooms, TV with satellite, WiFi internet, coffee maker, hairdryer, phone, mini fridge, safe deposit box and twin or double beds. The private balconies offers excellent views of the sea and surroundings. Guests can make use of facilities such as wake-up calls and room service (limited hours). The hotel has two buffet restaurants - Acandia and Castellania which serve breakfast, lunch and dinner, with local and international cuisines. There are a few a la carte restaurants - Cielo, an Italian restaurant, Won Ton a Chinese restaurant, Ellinadiko, a Greek restaurant and a Mexican restaurant, with prior reservation. Naiades, a snack café, Helios bar, pool bar and all-Inclusive bars all serve alcoholic and non-alcoholic drinks and host live events. 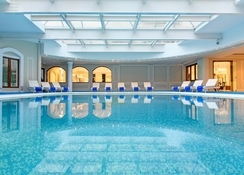 There are two outdoor swimming pools and one indoor in Mitsis Grand Hotel and these are surrounded by parasols and umbrellas. A tennis court and games arcade are also available. Fitness lovers can head to the gym and train with a personal trainer. The nearby sand and pebble beach is good for wind surfing, jet skiing, sailing, water skiing, pedal boating, parasailing and scuba diving. the hotel is very impressive,food great 6/7 different restaurants to try, Mexican,Italian,Asian,Greek,and the normal Buffet and dont forget the ice cream parlour and pizza man making pizzas all day long.rooms are of good size and for a little extra you can have a sea view.The all inclusive bar was great and they filled your fridge in your room every 2 days with beer and soft drinks,All in all a great holiday we will be going to this hotel again. Superb, anyone who finds major issues whilst staying at this hotel must be crazy. Fabulous. Brilliant central Hotel. 5* service and food. Nothing was too much trouble. Good entertainment in the evenings and well prepared cocktails. Rooms cleaned well and lovely fluffy towels. The choice of restaurants in the Hotel is the best we’ve had in Greece. Already looking at booking for next year. Absolutely fantastic stay at the Mitsis grand hotel in rhodes greece .six specialised restaurants to choose from , quality of food , level of service and standard of the facilities made are stay a very good stay . What a lovely hotel. We had a mix up over the room the first night. We had paid for a garden view room, but we given another room at the back where we had very noisy neighbours. They moved us the next day to the room we had booked for. There was a big bowl of fruit and wine for us. The rest of the stay was great. Fridge restocked everyday with drinks. Lovely big main restaurant with plenty of choice for everyone. Also the Chinese and Italian restaurants, which ate in one night and the food and service was second to none. The outside food areas near the pool where fantastic. They cater for everyone and the staff work so hard and cannot do enough for you. This is they best all inclusive hotel we have stayed in and we have stayed in many. Five star service but rooms not five star standard . Extra for safe and gym ! !